A wood pellet is a small, 1/4 inch diameter piece of hardwood and looks like a long pill. Because of their small size, wood pellets burn cleanly and quickly to a fine ash. Wood pellets burn at about 8,500 BTUs per pound per hour. Wood pellets come in a wide variety of "flavors" ranging from hickory and oak to cherry, apple or mesquite. The pellets in a normal pellet grill are fed from a storage hopper to a burning box at a controlled rate. This rate is adjustable based on whether you want a high temperature for grilling or a low temperature for smoking. Because of the automated feed of the wood pellets, you can literally turn the unit on, give it 10 to 15 minutes to heat up, and be ready to grill in almost no time. This makes it as convenient as a gas grill but with the added flavor of hardwood cooking. Yoder 640 Smoker Pellet Smoker/Grill comes standard with an easy-to-use digital control and two convenient exterior shelves. With an expansive cooking of 640 sqin combined with nearly 12 inches of headroom, plenty of room for anything including beer can chickens or turkeys. Adding the optional second shelf increases the cooking area to 1,070 sqin. 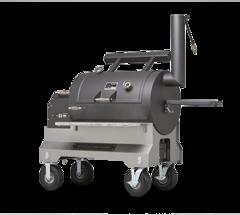 Yoder Smoker Pellet Smoker/Grills come standard with an easy-to-use digital control and two convenient exterior shelves. With a cooking surface of 480 square inches with nearly twelve inches of headroom, there's plenty of room for anything including beer can chickens or turkeys. Adding the optional second shelf increases cooking area on the YS480 to 800 square inches. 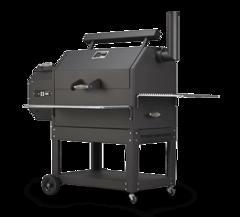 It's a 100% wood burning, pellet fired grill and smoker in one! With four zones of cooking you can do everything from Indirect cooking to cold smoking. 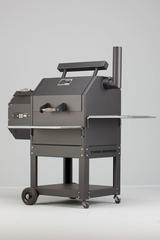 The PG500 will meet all your of your backyard cooking needs and more in a pellet style grill. 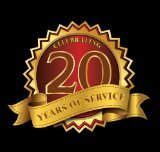 Customers have asked for it and here it is. The Yoder YS1500 Pellet Cooker has redefined versatile. The integrated heat management system (HMS) that was perfected in their wood pits is now available to pellet cooks! 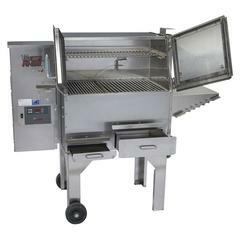 The HMS gives the pitmaster outstanding temperature control from side to side making it easy to grill off a bunch of steaks, fill it full of butts and briskets or cook an entire competition on it. Mounted on their competition cart with 10" pneumatic tires you have exceptional style and unmatched mobility from your trailer to cooking position. That's Yoder listening to your requests and delivering.